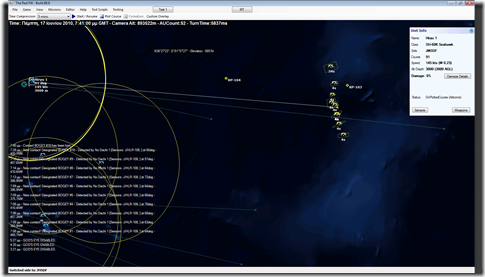 A new series of screenshots from The Red Pill, the new air/naval wargame under development at Warfare Sims, have been released from the internal testing team along with commentary. 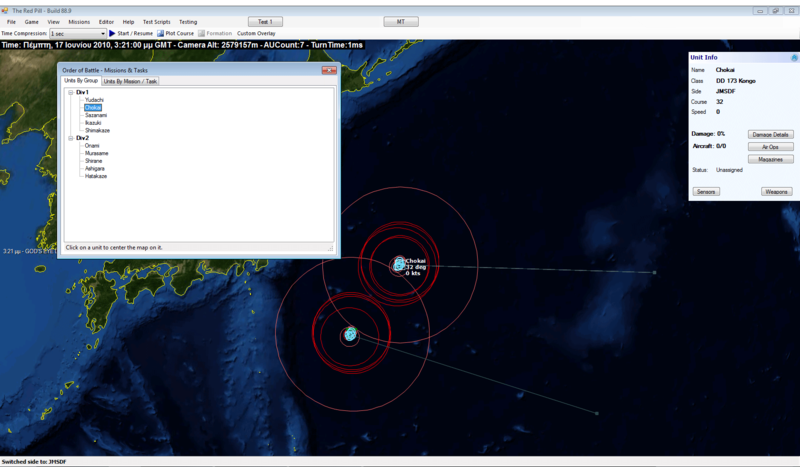 This is a simple ASuW-centered scenario addressing a hypothetical surface engagement exercise in the western Pacific in the summer of 2010. 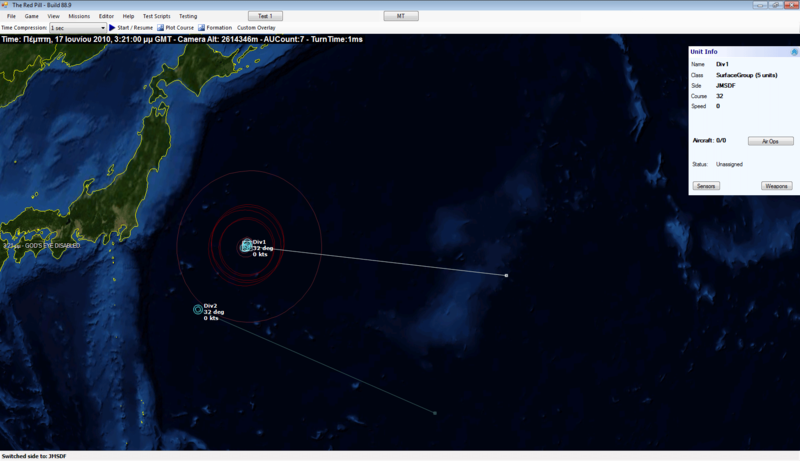 Two USN surface action groups, one of them including the amphibious ship USS Essex, must reach the Tokyo-Yukosuka area. Two JMSDF taskgroups act as OPFOR and must prevent them from doing so. There is no land-based air support or submarines; both sides must make do with their surface ships and what they can carry onboard. The Japanese have an advantage in numbers, but the US has more Aegis ships and lots more helicopters. The setup is 2-on-2 groups so there are plenty of decisions to make! First two screens are the starting setups of each side (click for full size). Notice that, even though the tactical display is in group-mode, by selecting a group we can see its member units and their weapon/sensor range rings dimmed out. This is a feature long (more than a decade long!) 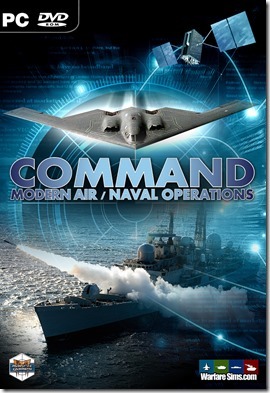 requested by the air/naval wargaming community, and Red Pill is the first to deliver on it. The Japanese player opens the OOB window to get a better feel of the composition & disposition of his assets. By click-selecting any unit in the OOB window, the map centers and focuses on that unit. This makes it easy to find a desired unit to control without having to remember where it is located. The OOB window can also list the units grouped by the mission to which they are assigned. Any reference point can be anchored to any map unit (friendly or otherwise) and maintain a constant range & bearing from it. This allows the creation of truly “mobile” patrol areas/screens, exclusion zones, threat zones etc. In this case, the JMSDF player has anchored the patrol area’s reference points to the center of his northern taskgroup, so whichever way the group moves, the patrol area will automatically adjust its location relative to it. Units assigned to such mobile patrol areas are not restricted to the group’s own assets but may include any friendly unit. 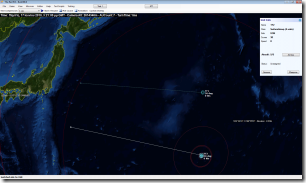 If the JMSDF player had available P-3s in any nearby airbase, for example, he could have assigned them to the same patrol area as the helicopters of his surface group. The helicopter patrol is beginning to bear results. 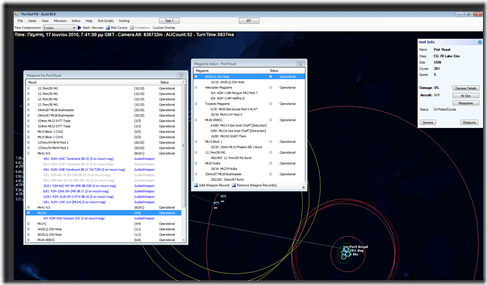 A string of helicopter contacts are passively detected by the ESM gear on the Japanese helicopters and surface ships. 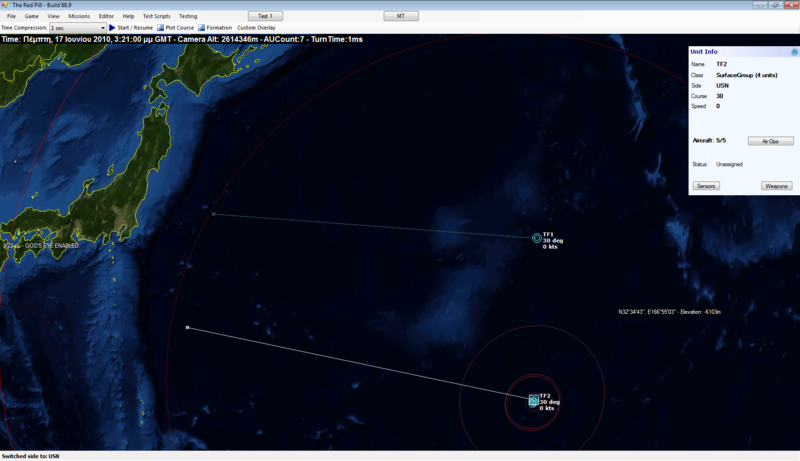 The USN player has been a bit careless in organizing his own helo patrols and may unknowingly give his JMSDF adversary a hint about the location of at least some of his ships. The USN player suspects he may be already detected and decides to do a weapons check on one of his prime combatants, the cruiser Port Royal. 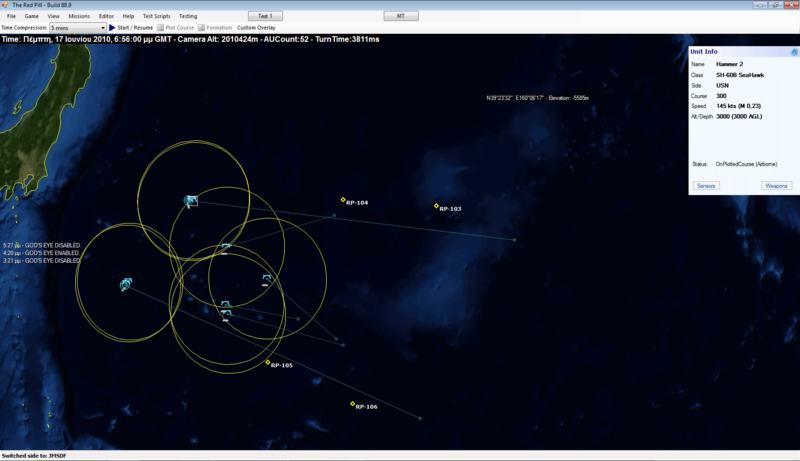 Plenty of firepower (including a bunch of SM-3s) and all systems operational. Whatever comes, she’s ready. 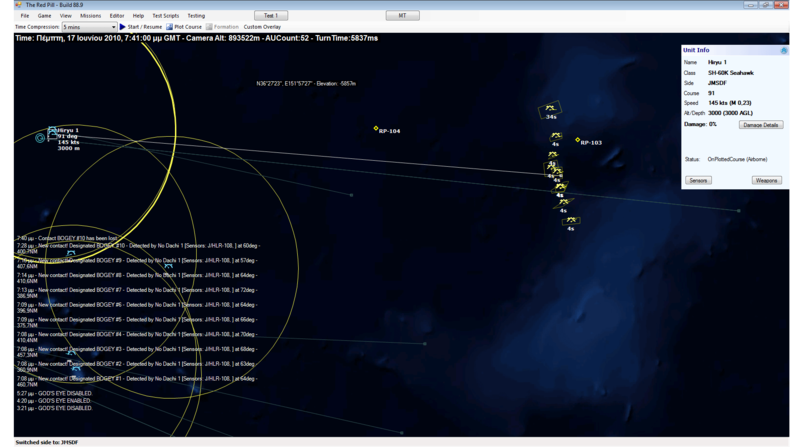 More screenshots from the same scenario to follow soon.